A captured moment in the sumptuous gardens at Eltham Palace, a beautiful stately pile close to London. This young woman, with camera hanging from her shoulder, was taking a moment during her visit. 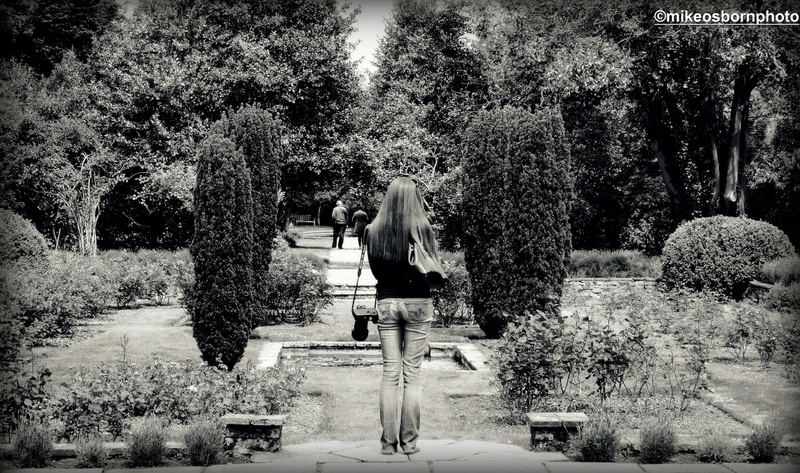 She was standing in the right spot in this stretch of formal garden. It was my chance to take a photograph without being detected. This tends to be the only time when human subjects make their way into my photography, when the stories can only be speculated upon. You old romantic, you! Lovely image, perfectly summing up the peace and tranquility of the place! Thanks Richard, glad you like it. She was in the right place at the right moment… as was I! Great rendition and atmosphere in this shot Mike. Thanks James. She was hard to ignore but stood still long enough for some composition to be established.